Whether it’s playing basketball or collecting canned goods for the needy, Andrew Fleming gives 100-percent to every endeavor he’s involved with. Tae Kwon Do is no different. “He loves practicing his Tae Kwon Do moves, consistently. He also gets a lot of joy from learning the Korean terms, and becoming more proficient in another language,” says his mom LaKeisha. In fact, she loves the changes she has seen in Andrew since he began classes in the Fayetteville location last November. “Andrew enjoys discipline and structure. 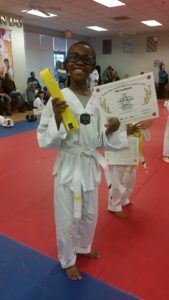 I love the way Tae Kwon Do has given him a positive and productive way to express those traits.” The 11-year-old is excited to have just become a blue belt and looks forward to continuing to ascend the ranks. Here’s more from our student, Andrew Fleming. Did you have any problems/issues that Tae Kwon Do helped you overcome? My physical endurance and stamina were very weak before I started Tae Kwon Do. Now they are excellent. I feel more confident that I can protect and defend myself, and I feel better about myself. Yes, it exercises the body and the mind. Why do you like Tae Kwon Do? Why would you tell another kid that it is fun to do? I most enjoy getting to advance to new belt colors. It helps you know how to defend yourself and be more confident that you can keep yourself safe. Why do you like taking classes at Master Shim’s World Class Tae Kwon Do? The instructors are excellent and help you make sure that you know exactly what to do and how to do it.